FooCall. Say it slowly, in two parts… Fook. All. Now say that together? Fook All. FooCall. That’s right! International calling for next to nothing. I’ve used a lot of international calling services, particularly from my mobile phone. For a long time I made use of an array of services that enabled me to call locally and then use an existing balance to call internationally. When I was having to phone venture capitalists and board members in the States regularly, the costs used to mount up at 24p a minute from British Telecom. Calling internationally from a mobile was simply ridiculous. It still is, even with the ‘international’ option on the account, you’re still billed silly rates. I can call America from my mobile at 5p per minute, because I pay Vodafone a few quid a month extra. I remember thinking ‘ahh, that’s better’. Because instead of £1.50 (or something crazy), 5p sounds good. Until you realise that it’s costing Vodafone almost nothing. Yes they need to maintain the mobile cell, but if I can call any landline in the UK for ‘free’ (unlimited, fair use), why can’t I call America for a few pence a minute? You know? 2p, something like that? Well, the answer is that it’s still a good way to garner cash from us all — and we can’t believe it’s not costing £1.50 a minute, so we pay. It’s almost a fifth cheaper if you use FooCall. It’s even cheaper if you pay a few pounds a month. Quite apart from the fact that anyone who’s named their company in that manner deserves my business, I’m delighted that they’ve made an iPhone application to make the experience super simple. I’d like to see them deploy on other platforms too. This is the main screen. It’s really easy to use. Once you’ve created a free account — that process takes 20 seconds — you can start calling. Literally dial the number you want. FooCall then calculates a local access point — i.e. an 020 number that counts toward your inclusive minutes. It places the call to the local access number and automatically dials your destination for you. This all happens in about a second. Within moments you’re connected. Done. Now let’s talk about rates. By default, it’s 1.2p/minute to the United States from the UK. That’s a pretty good rate in itself. But if you’re calling regularly, you might like to take note of the FooCall FooPlan. It’s £2.75/month and reduces that rate down to 0.8p/minute. If you’d like to confirm your reservation at The Sanctuary at Parrot Cay on the Turks & Caicos Islands? 13.7p/min. You can even call Antarctica. That’s 100.7p per minute — but drops to 67.2p if you’re on the FooPlan. Pretty nifty, eh? That’s a unique number for you that puts you straight through to your destination without any messing around. I particularly like that if I add a contact on the iPhone app, it’s synchronised straight through to the web version of FooCall too. Nope – still not as competitive as Skype allowing me free US & Canada calls through a UK number for Ã‚Â£15 / year. What if you called America, New Zealand, India and the Bahamas for an hour a week each? Who'd work out better? Luckily for me I just have a brother in Canada, but you're right that calling those locations looks like it would work out cheaper. 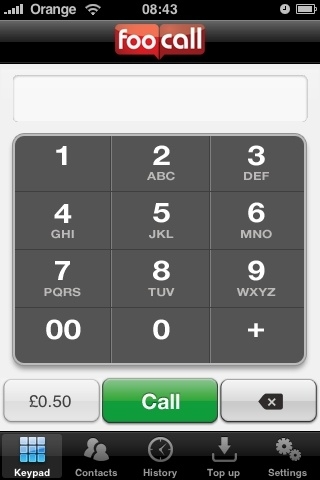 Foocall does look very cheap. Okay, Skype has some plans but if you simply compare Foocall to Skype rates (just PAYG ignoring the Foocall Ã‚Â£2.75/month option) Foocall is definitely cheaper. Take the Canada example – Skype = 1.2p/minute, FooCall = 0.7p/minute. Should also point out that Skype is pure VoIP, whereas, this new Foocall service is using local dial in numbers, so call quality / reliability should be much better. True, except I get “Skype To Go” for free with my yearly Skype subscription and that gives me a local access number to SkypeOut with superb quality and reliability. I can assure you that absolutely every company except the one I am using is charging some type of hidden fee. Skype Out charges a BT minimum charge, a connection fee and is pretty expensive when calling other countries just google the words 'skype rates'. The only company that does not even require a signup, and calculates calls to the precise second (unlike Skype) is http://www.kangatel.co.uk. Wrong wrong wrong. You can't assure anyone of any such thing and can be locked up for making statements that are that inaccurate. Let's take this service you mention and FooCall in the article above. FooCall is consistently cheaper on call rates. They don't charge connection fees, there are no minimum call charges, they bill per second. Besides Kangatel can only be used on T Mobile, 3 and some Orange services. They also seem to be unable to grasp the concept of inclusive minutes – they are just that – paid for, thus no incremental cost. FooCall and no doubt other services out there beat Kangatel hands down. Inclusive minutes do cost Merrick. On my Orange package I would be paying 6p, so any rates on top of that might cost me 7p or 8p. The concept of inclusive minutes is in my opinion a con. This is why I prefer services such as Kangatel. Thanks for the info, It's my first time to heard foocall. Which is better foocall or skype? PennyTel has per has a low flat per call rate for major countries for $2.50 per month. Once again – can we emphasise that this is a ‘Dial-Through’ application. In order to make an international call the application dials a UK geographic number into a PoP, and then forwards the call onto the international destination. A solution that offers Voice-over-WiFi (VoWiFi) will be a better solution for most parties; particularly those that travel internationally or live outside of GSM coverage areas.